If every action has a equal and opposite reaction,then if for example i pushed a football with a force of 10N,then the ball will give a reaction to me with 10N,but due to my huge mass i will not move but that reaction given by the ball is also a action for which there should be another reaction by me to the ball and ball should move out due to my 10N force and this would have continued and it would have no end but it does not happen.Why? It does not go on.It is only one reaction against one action. A car travels a distance 100m with a constant acceleration and average velocity 20 ms-1.The final velocity acqired by the car is 25 m s-1 . Find initial velocity and acceleration of the car. 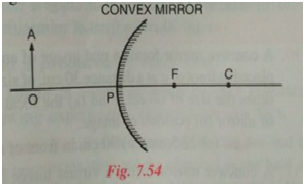 The diagram above in Fig shows a convex mirror.C is its centre of curvature and F is its focus. (i)Draw two rays from A and hence locate the position of image of object OA.Label the image IB. (ii)State three characteristics of the image. I want to know that in the numericals of chapter upthurst. Why we dont put the value of g but let it be like that. May I get some numericals using mirror's formula?